The F-35 Lightning, the ultimate result of the Joint Strike Fighter program, is entering service with the Marines and Air Force. Its prototype, the X-35, won the competition in 2001, but it wasn't the only serious contender. In fact, we were close to going in a very different direction. Boeing had its own entry into the JSF competition, the X-32, which would have been the F-32 had it won. While the F-35 looks like a single-engine version of the F-22, the X-32 bore a resemblance to the A-7 Corsair, which is affectionately known as the SLUF, or "short little ugly f*cker." Like the X-35, Boeing's offering was to be cheaper than the F-22 Raptor and was intended to replace the F-16 Fighting Falcon, F/A-18 Hornet, A-10 Thunderbolt, and AV-8B Harrier. 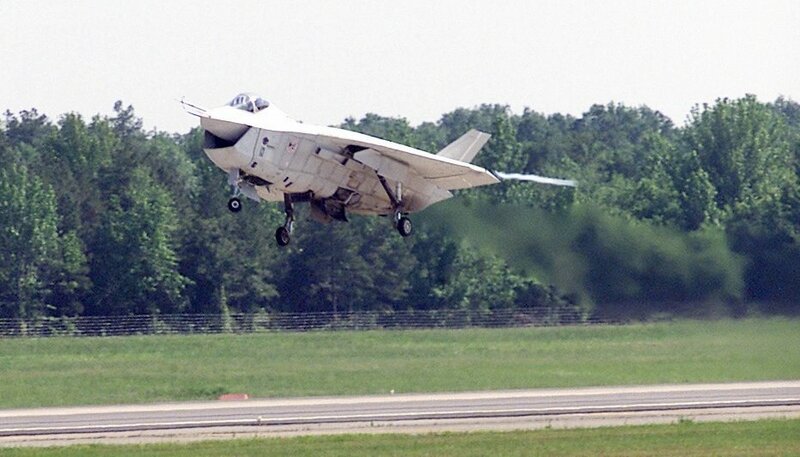 The X-32 taking off from Little Rock Air Force Base during the fly-off. The X-32 and X-35 were selected to take part in a fly-off in 1996, beating out designs from Northrop Grumman and McDonnell Douglas. The X-32 was based on reliable technology. To achieve Vertical/Short Take-Off and Landing capability, it used a thrust-vectoring system similar to that used by the AV-8B Harrier. It had a top speed of 1,243 miles per hour and a maximum unrefueled range of 979 miles. It packed a M61 20mm gun (again, proven technology) and was capable of carrying as many as six AIM-120 Advanced Medium-Range Air-to-Air Missiles or up to 15,000 pounds of bombs. Lockheed's X-35 used a separate lift-fan, much like the failed Yak-141 fighter. That gave it a performance edge over the X-32. As a result, "Monica" ended up losing out. Both X-32 prototypes survived and have since been sent to museums. Learn more about the Joint Strike Fighter that could have been in the video below.